The Tuolumne-Stanislaus Integrated Regional Water Management Group has a diverse membership, which includes water agencies, city and county officials, environmental groups and Tuolumne Utilities District staff. The purpose of the IRWMP is to develop a water resources management strategy for the region. The plan, when completed, will include a priority list of project to improve water supply reliability, water quality and the environment in the Tuolumne and Stanislaus region. To find out more about Tuolumne-Stanislaus IRWM Plan, please visit their website here. The approximately 2,700 square miles of the T-S Region span the entire western slope of the Sierra Nevada, encompassing the Upper Tuolumne River, Upper Stanislaus River, and Upper Rock Creek-French Camp Slough watersheds. 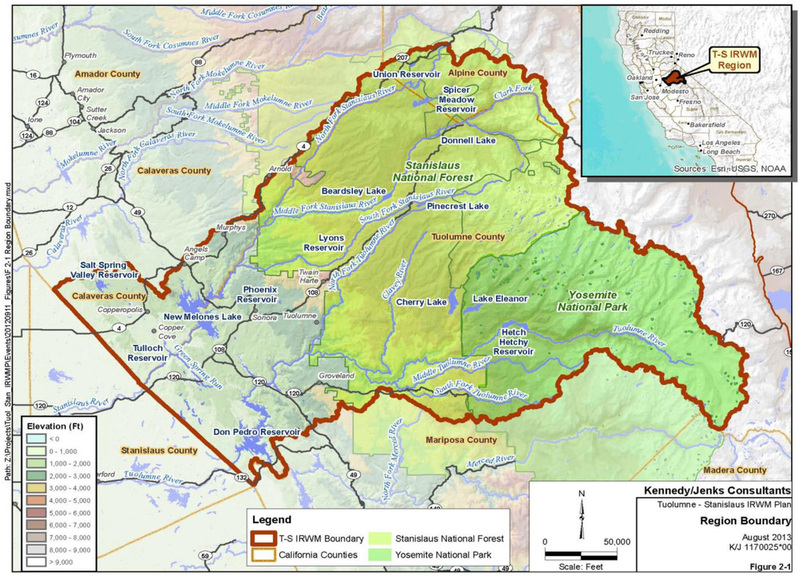 The Region includes all of Tuolumne County, the southern portion of Calaveras County, and southwestern Alpine County. The majority of the Region’s approximately 70,000 people reside in the foothills at elevations below 3,000 feet. Major communities of the T-S Region include Sonora, Twain Harte, Copper Cove, Copperopolis, Angels Camp, Murphys, and Groveland. Many of the Region’s communities have been identified as Disadvantaged Communities (DACs) which have median household incomes less than $48,706 per DWR criteria. The Region is also home to two federally recognized Me-Wuk tribes. The T-S Region boasts a high diversity of ecosystems and environmental resources. About 2/3 of the land area within the T-S Region is covered by coniferous forests in the Stanislaus National Forest and Yosemite National Park. The lakes, creeks, meadows and other natural features of the Region provide key habitat for many of California’s most important aquatic and terrestrial species. In addition, the Region’s rivers, reservoirs and lakes provide extensive opportunities for water-dependent recreation popular to users within and beyond Region boundaries. The Tuolumne-Stanislaus regional economy continues to evolve from the historic industries of agriculture, mining and timber, to a more service-based economy. Surface water supplies the majority of water resource needs for the T-S Region and is generally good quality, with the only issues resulting from current and historical land use. The Upper Stanislaus and Upper Tuolumne River watersheds provide abundant water resources, crucial to river ecosystems and millions of people. These rivers irrigate hundreds of thousands of acres of prime farmland, and produce hydroelectric energy used throughout California. These surface waters are the regional primary source of potable water, while 98% of the supply serves export water demand purposes.The surface water conveyance system consists of an extensive system of pipelines, canals, ditches and flumes, many of which are remnants of the Region’s historical water system used for mining and support industries during the 19th Century. However, groundwater quality is highly variable, as it is primarily found in fractured bedrock and is largely unquantified. Nevertheless, groundwater is a primary water supply source for many individual homeowners and small water systems in the T-S Region. Efficient Use and Distribution of Water Needs – Limited surface water and groundwater supplies in some portions of the Region, coupled with recent California regulatory mandates have created a growing need to increase the Region’s municipal water use efficiency. However, conditions exist in the Region that make implementation of such programs challenging. Recycled water provides a means to offset potable water supplies and increase water use efficiency. Currently, various water reuse programs exist in the T-S Region and there is an interest in expanding water reuse projects. The Region’s availability of water resources is conducive to hydropower generation, which may play an increasingly greater role as efforts increase to expand renewable energy sources. However, it is important to balance hydropower improvements with competing beneficial use requirements and costs. Reliable and Affordable Water Supply Needs – Water supply reliability needs within the Region is a complex issue that varies throughout the Region, but overall there is a need to develop reliable and affordable water supplies to support existing customers as well as accommodate future land use development and population growth. Although the Region in general is situated in highly productive watersheds much of the surface water available in the Region is held under senior water rights, is exported for use outside the Region, and/or stored and used for other purposes, such as hydropower generation. These factors put constraints on efforts to enhance water supply reliability within the T-S Region. Groundwater supplies that primarily serve small water systems are also subject to reliability issues. Meeting Water Quality Needs – The quality of local groundwater can be highly variable depending on highly localized factors including, but not limited to, high salinity, nitrate, iron, and manganese. Contamination from septic tanks is a large concern in the Region, which is related to aging systems as well as systems that are approved for newer land use projects. Recycled Water Use for Agricultural - Various factors are contributing to impaired water quality in the Region relating to historic and existing activities. A major concern is pollution from non-point sources that are thought to be resulting in impacts to surface water and groundwater quality. Non-point sources in the Region include various activities, such as failing septic systems, pesticide/herbicide/fertilizer use, sediment discharge, oils and greases, cattle, and other livestock grazing and agriculture, forest use, recreation, urban runoff and historic mining activities. Many land use activities are contributing to water quality impairments and there is an identified need for increased coordination between land use planning entities and water agencies. Resource Stewardship and Ecosystem Needs – The health of the Region’s ecosystems, including meadows and riparian systems, is an important factor in the quality and availability of water resources in the T-S Region. Various ecosystem restoration projects have the potential to provide numerous water resource related benefits in addition to species protection. Additionally, with over two-thirds of the Region’s land area dominated by coniferous forests, forest management including prevention of catastrophic wildfires is considered an important component in the water management planning within the Region. Stormwater System Capacity (Flood Management) – Management and containment of localized flooding of creeks and tributaries, particularly in urban areas such as Sonora, and along some local roadways has been a challenge and several stormwater conveyance systems within the Region are in need of improvements to reduce the potential for flooding. Climate Change – Climate change has the potential to have significant impacts on the T-S Region. Water demand, water supply, water quality, hydropower, and ecosystem and habitat vulnerability are all areas likely to be affected in some way due to climate change. The major river systems in the Region are fed primarily by snowmelt. Therefore, expected changes in snowpack levels due to climate change may impact the Region’s primary water sources. Additionally, increased temperatures could lead to decreased hydropower production, impaired water quality and increased wildfire risk.